The Rev. David Chivington, of Sidney First United Methodist Church, as the Right Rev. Chivington, will lead a service like one from the 1860s in Tawawa Park, Sunday. SIDNEY — The Rev. David Chivington, senior pastor of Sidney First United Methodist Church, will portray The Right Rev. 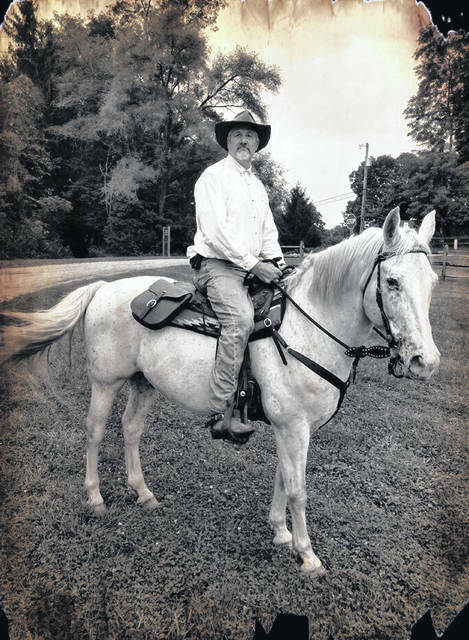 David Chivington, a circuit rider preacher representing the United Methodist Church in 1860, to lead a worship service, Sunday, Sept. 16 at 8:30 a.m., in Tawawa Park. Assisting with worship will be the 73rd Ohio Volunteer Infantry Regimental Band. The service will be in the Education Tent near the covered bridge during the Civil War Re-enactment. The Methodist Church in America was built on the backs of traveling preachers and circuit riders, who braved the elements while riding from one small church to another. In this area of Ohio, a circuit might include a significant number of churches in several counties. While members waited for the preacher to arrive, the leadership of the church was in the hands of lay leaders, who would hold the class meetings. Sunday, the reverend will lead those present in traditional worship from the 1860s, including traditional Methodist hymns and scripture readings. All are welcome to attend. Period costume is encouraged but not required.